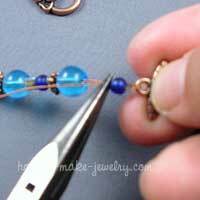 Stringing beads is immediate gratification. 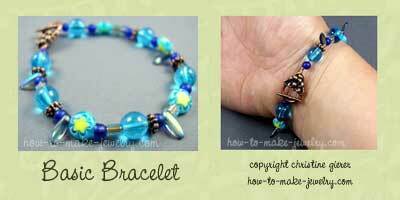 Using these instructions for stringing beads, you can easily make bracelets like the two being modeled by my 4 year-old daughter Zoe in less than an hour. Aren't they cute? 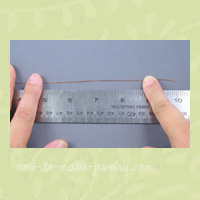 These instructions will show you how to string a one-strand bracelet, but you can easily adapt this tutorial for stringing a multi-strand project or a necklace or anklet as well. As you get more proficient at stringing, I'm sure you'll see that you can make dozens of different looks using the same basic technique. 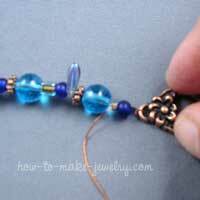 You can add more strands to make a multi strand bracelet or necklace, or use crimps along the length of the cable to create an illusion necklace. 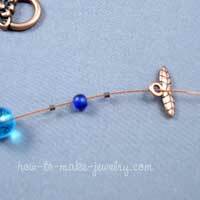 Adding different findings, beads, and dangles can also totally change the look. But it all starts with this one basic cable stringing technique. 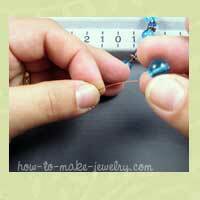 To make a basic strung bracelet, about an hour should do it. Cut 10" of stringing cable. 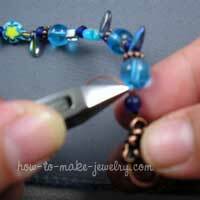 Put a beadstopper or piece of tape on the end of your cable so the beads don't fall off. Lay out your design. I like to start in the middle and work outwards. You'll need about 6" worth of beads for a 7" wrist. 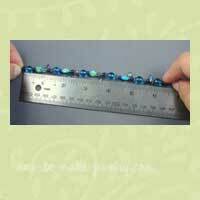 Measure the length of your strung beads. 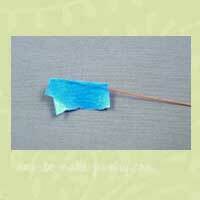 You'll need about the same amount as your wrist size less one inch. (The extra inch is for your clasp). Take the tape off one end of your cable, take off last bead strung, then string a crimp tube, the bead you just removed, another crimp tube, then one half of your toggle clasp. String the end of your cable back through the 1st crimp tube, the bead, and the 2nd crimp tube. Snug everything up nice and squoosh each crimp tube with your chain nose pliers. Give the end a tug to make sure everything is secure. 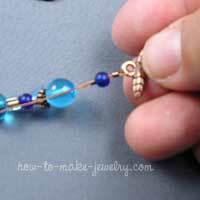 Do the same on the other end with your remaining half of the toggle clasp. Try on your bracelet for one last size check. If everything is A-OK size-wise, trim the ends of cable with your flush cutters. 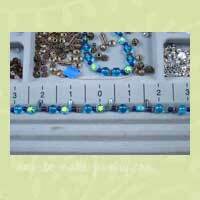 To keep your beads from rolling around, lay out your beads on a bead board, on a towel or bead mat, or on a piece of masking tape secured to a table sticky side up. For extra security, I like to double crimp anything I make. You can certainly single crimp if you'd like to. When snugging everything up, it helps to hold the loop of the cable with your chain nose pliers. If you still find it difficult to pull the cable end up tight enough, try pulling using another pair of pliers. You can use crimping pliers to fold the crimp tube over into more of a tube if you like (a little more advanced). I didn't mention it above just 'cuz this is supposed to be a beginner tutorial. If you want to hide the crimps, use the front part of your crimping pliers to gently close crimp covers over each of your crimps.